Early childhood tends to be a time when minds are the most malleable. As youngsters reach an age where they can branch (if only somewhat) from their parent’s direct care, they are at the ripest point possible to take in loads of crucial information, as well as harness the ability to maintain and expand upon it. But while early childhood tends to be a beacon of increased learning, it can also be a frustrating one for both student and educator. Unless the right tools are implemented, a well-intended lesson plan can go array in an instant. And as any early childhood educator will tell you, remaining on top of what makes their student’s “tick” when it comes to learning tends to be the most pivotal part of instructing younger children. 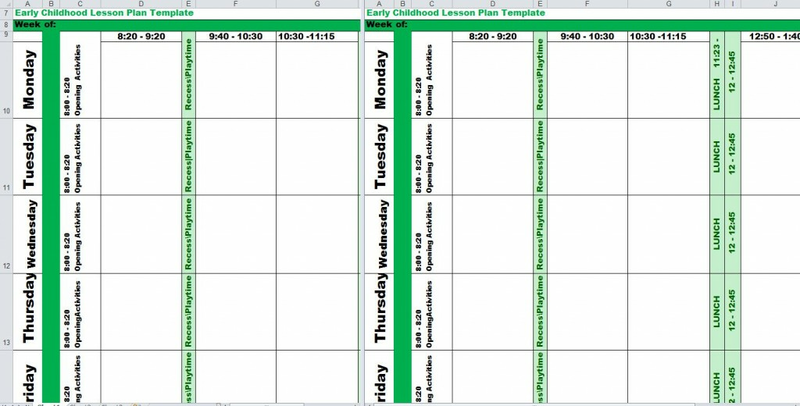 And with the Early Childhood Lesson Plan Template from ExcelTemplates.com, early childhood educators can both assess what causes they’re students to excite at the notion of learning, as well as map for any future needs. The key to any early childhood lesson plan is adaptability. As educators become more and more accustomed to their classes’ individual learning style and preferences, they’ll be keener when honing in on learning necessities and strengths. Devise and construct thorough, useful and integrative education plans for their young learners – all from a single, organized vehicle. Keep track of individual, as well as classroom, strengths and weaknesses. Educators can then properly plan for both cases. 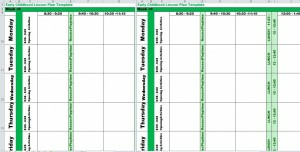 Present an organized, completed chart for principals and reviewers to assess. Be patient with your classes’ learning path. Younger children tend to adapt to learning processes at varying speeds, and will take a liking to different learning styles. Be aware of individual student strengths and weaknesses, and be sure to take note. Be prepared to change plans on a whim. Not all kinds of teaching methods will apply to each individual student – some kinds of learning styles will frustrate and flummox younger students.